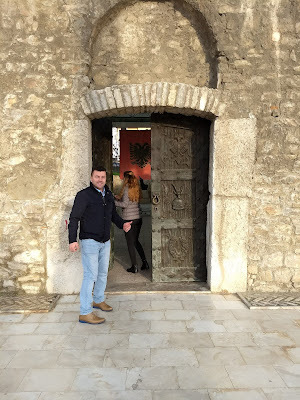 February is a good time to see Albania, because the weather is moderate and there are few tourists. Rain is a possibility, but it's not a cold rain. 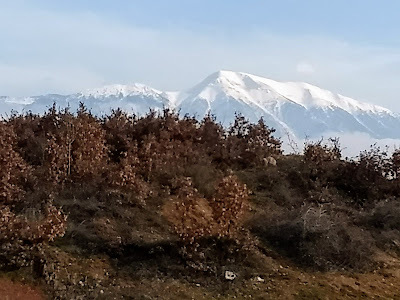 With this in mind I set out with two friends, Muje and Nuhi to see what we could see in three days in Albania. We focused on history and food, which was absolutely fine for me. Both Muje and Nuhi are Albanians from near by Macedonia. Albanian was their first language and they both has been raised in the culture. Muje spoke good English and Nuhi knew only a few words. I speak only a few words of Albanian. Nuhi and I passed a lot of time learning each other's languages. Nuhi drove and I sat in the passenger seat. I had spent over a week in Kosovo on business so Muje and Nuhi picked me up there. We drove Kosovo's four lane highway E851 from Pristina to the border of Albania. 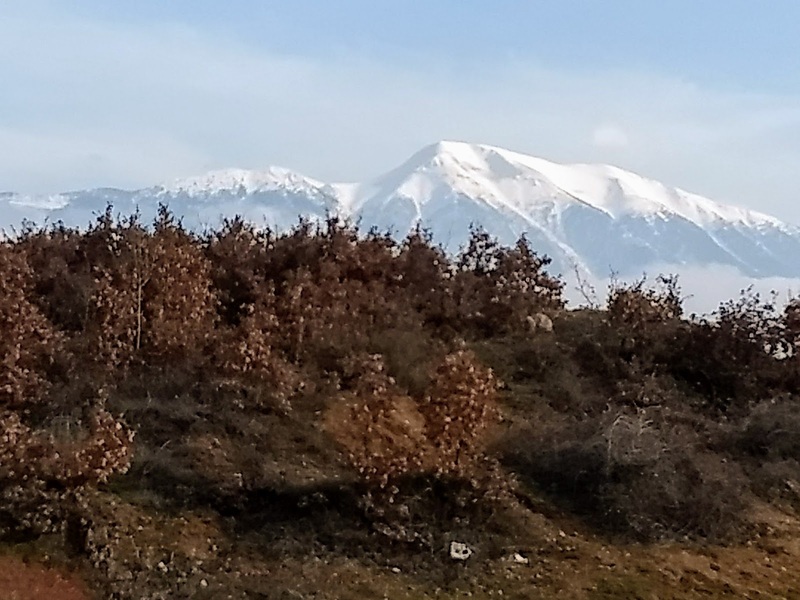 Soon after crossing the border into Albania, we stopped to get a view of the majestic Accursed Mountain range that welcomed us. The mountains were snow covered and reminded me very much of some of the mountains I see in my home state of Utah. On one side we saw the White Drin or river and on the other the Bardhoc and Gjegjen mountains. Majestic mountains welcomed us to Albania. 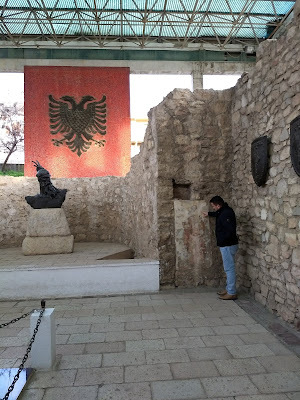 An hour later we left the major freeway and made our way to the town of Lezhë where Gjergj Kastrioti Skanderbeg, Albania's warrior hero, was buried in St. Nicholas church in 1466 at 61 years old. At first Kastrioti fought for the Ottomans and was given the name Skanderbeg a designation for leader. But, then he turned against them in a rebellion that was to free Albania from Ottoman rule, at least during his lifetime. The names of his battles in locations in Albania and Macedonia are listed on shields along the walls of the memorial. After his death, according to our guide, legend says that the Ottomans took his bones from his grave and scattered them on the ground. His followers secreted them away and returned them to St. Nicholas church. After the fall of Albania to the Ottomans the Kingdom of Naples gave land and noble title to Skanderbeg's family, the Kastrioti (Castriota). We paid a guide to open the church doors and give us a tour. are shields naming the locations of Kastrioti's battles.